High sensitivity, high resolution, and an ultra-low stray-light level achieved with the latest “three(3) detectors” technology. It consist of a PMT (photomultiplier tube) for the ultraviolet and visible regions and an InGaAs detector and a cooled PbS detector for the near- infrared region. Using a high-performance double monochromator makes it possible to attain an ultra-low stray-light level (0.00005% max. at 340 nm) with a high resolution (maximum resolution: 0.1 nm). The wide wavelength range of 185 to 3,300 nm enables measurement over the ultraviolet, visible, and near-infrared regions. 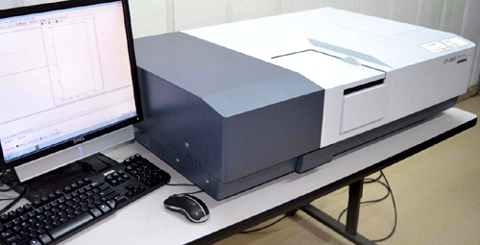 This instrument can perform spectrophotometry for a variety of different fields. More Info. Available upon Request.